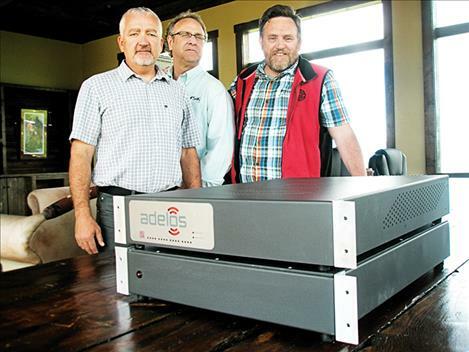 Adelos’ employees Scott Colton, Dermot O’Halloran and Alex Philp stand next to the company’s world class, fiber optic acoustic sensor. POLSON — A world class technology company is moving forward in Lake County. Adelos, a subsidiary of S&K Technologies Inc., received a two-year $2.5 million security contract with the U.S. Air Force following a competitive bid process last year. According to chief executive officer Scott Colton, Adelos was one of 8,900 companies that submitted proposals to the U.S. Air Force’s Rapid Innovation Fund research and development program. Adelos was one of nine companies selected. The five-employee company builds fiber optic sensor systems. The current project will provide an acoustic sensor that uses sound waves to identify drones or other aircraft, people walking or tunneling activity, for example. Adelos is using and expanding on technology developed by the U.S. Naval Undersea Warfare Center in Newport, Rhode Island, said Alex Philp, Adelos’ chief technology officer who founded the company in 2006. The contract calls for delivery of one unit at an Air Force base in the spring of 2018. The fiber optic sensor will provide the Air Force with unprecedented situational awareness and an early warning/intrusion detection capability at its intercontinental ballistic missile launch facilities. “This sensor is unique,” Philp said, noting it can detect activity in the air, on the ground and under the ground simultaneously. “We can determine where it is, when it is occurring and what it is,” he said. The unit, which was manufactured by S&K Electronics in Pablo, consists of a laser in the bottom and electrical optic machinery in the top. In expanding the technology, Adelos is competing mainly against companies in Israel and Great Britain, Philp said. “We’re the only company in Montana doing anything as remotely sophisticated as the technology in these boxes,” he said. The current contract is the third iteration of the project, with predecessors installed at the Idaho National Laboratory and the U.S. Navy facility in Keyport, Washington, Colton said in a press release. He notes that Adelos technology has other applications too, including the oil and natural gas industry where a sensor can be deployed inside a well with a fiber optic cable to provide information on changes in oil, gas or water pressures. Adelos is 87-percent owned by S&K Technologies, which is wholly owned by the Confederated Salish and Kootenai Tribes. The company now known as Adelos was founded in Missoula in 2006 as TerraEchos. S&K Technologies purchased it in 2009, renamed the company Adelos and relocated it to Polson in 2012. S&K Technologies, which was founded in 1999, also owns S&K Aerospace, S&K Global Solutions, S&K Engineering and Research and S&K Logistics Services. The S&K family of companies has offices in nine states, the District of Columbia and Riyadh, Saudi Arabia. It has strategic partnerships with a variety of companies, including Booz Allen Hamilton, General Dynamics, Boeing Aerospace, Lockheed Martin, Northrup Grumman, Raytheon, AT&T, Honeywell and ALCOA. S&K Technologies, which employs over 400 people, totaled over $350 million sales and paid nearly $30 million in annual dividends to the CSKT’s Tribal Council since its inception, according to a press release. Adelos is located at 145 Southlake Crest on a hill in the Ridgewater development in Polson. S&K Technologies in located in St. Ignatius.